The PE-detection reagent provided with each soluble protein Flex Set is a 50X bulk (1 pL/test) and should be mixed with other soluble protein Flex Set PE-detection reagent and diluted to their optimal volume per test (50 pL/test) before adding the PE-detection reagents to a given tube or assay well. 1. Determine the number of soluble protein Flex Sets to be used in each tube or assay well in the experiment (size of the multiplex). 2. Determine the number of assay tubes or wells to be run in the experiment. 3. Transfer 1 pL/test of each soluble protein Flex Set PE-detection reagent to a conical tube labeled "mixed PE-detection reagent." 4. Add detection reagent diluent to the mixed PE-detection reagent tube to bring the final volume to 50 pL/test. Example: if five soluble protein Flex Sets are being multiplexed for a given 20 test experiment, you would add 1 pL/test of each soluble protein Flex Set PE-detection reagent to the mixed PE-detection reagent tube (1 pL/test X 20 tests = 20 pL total volume of each PE-detection reagent) and then add detection reagent diluent to bring the final volume to 50 pL/test by determining the remaining volume to add (the final volume of mixed PE-detection reagent is 20 tests X 50 pL/test = 1000 pL). 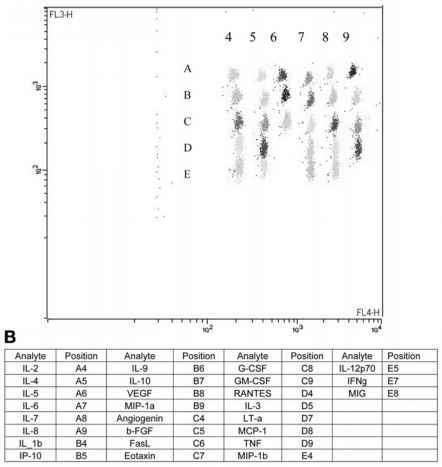 A total of 100 pL of PE-detection reagent was added to the mixed PE-detection reagent tube previously listed when 20 pL total volume of each PE-detection reagent was added from the five soluble protein Flex Sets. The amount of detection reagent diluent to add is 1000 pL total volume - 100 pL of PE-detection reagents = 900 pL). 5. Vortex mixed PE-detection reagent briefly. Mixed PE-detection reagent is now ready to be used in the experiment.